If you’re looking to spice things up this season, skip the complicated cocktails and instead warm the hearts (and hands) of your party guests with a batch of mulled wine or cider. Make the mulling spice blend ahead of time and either pack each batch of spices in a muslin bag tied with twine with a gift tag or in a Mason jar tagged with a homemade label with directions for use, and give as a gift, or keep it warm in a sauce pot on the stove to serve at your own holiday gathering. The recipe can be doubled or tripled for larger batches if you’ve got lots of gifts to give (just make sure to evenly distribute the orange slices and cinnamon sticks). Heat the oven to 200°. Using a sharp knife or mandoline, slice the orange crosswise into ⅛-inch-thick rounds. Thinly slice the ginger crosswise. Line a sheet pan with a rack. Arrange the orange rounds and ginger slices on the rack, spacing them evenly. Place in the oven and cook, turning the rounds and slices halfway through, until the orange is crisp and dried all the way through, about 3 hours. Remove from the oven and let cool on the rack. Set out 4 clean mason jars or muslin or waxed paper bags. To each jar or bag, add 2 each dried orange rounds, ginger slices, and cinnamon sticks, 6 black peppercorns, 3 allspice berries, 2 each whole star anise and cloves, and 1 cardamom pod. Secure the jars with a lid or the bags with butcher’s twine. The spices will keep for up to 1 month. In a large sauce pot, stir together the red wine or cider and the mulling spices. Over low heat, bring to a simmer, cover, and cook for at least 10 minutes before serving. 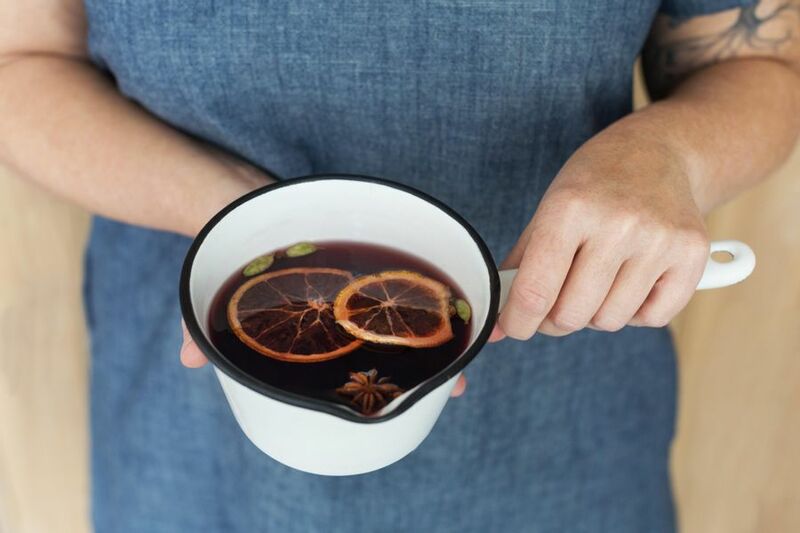 Ladle the mulled wine or cider into individual glasses or mugs, garnish with an additional cinnamon stick or dried orange slice, and serve. Nutrition per serving: Calories: 190, Protein: 1g (2% DV), Fiber: 2g (8% DV), Total Fat: 0g (0% DV), Monounsaturated Fat: 0g, Polyunsaturated Fat: 0g, Saturated Fat: 0g (0% DV), Cholesterol: 0mg (0% DV), Sodium: 10mg (0% DV), Carbohydrates: 13g (4% DV), Total Sugars: 4g, Added Sugars: 0g (0% DV). Not a significant source of trans fat.